One of the more popular questions we get from new competitors is typically about hoops. 1) How do we get our dog to go through them? 2) Is it a replacement for a jump? Now sadly we can only really answer #2 and #3, how you train your dog to perform obstacles is totally up to you and part of the fun of dog training! For the other two though there are some more concrete answers. #3) The intended challenge of hoops really has to do with the amount of time it takes the dog to perform them, and how that affects handling. When a dog performs a jump, even the fastest of dogs, you will still have a split second amount of time while that dog is in the air to prepare for your next command, body position changes, whatever you need. It’s not a lot of time, but it is time that you as a handler have as a mental break. With hoops, that time is completely gone. 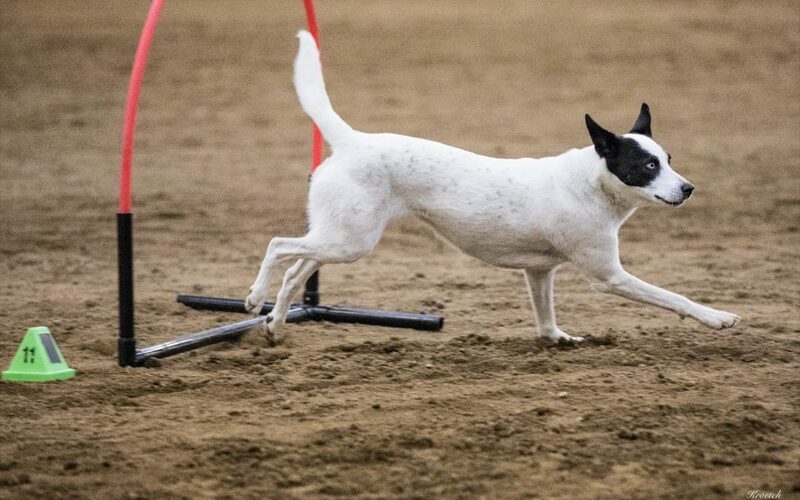 And you have to be completely on point the entire time your dog is performing the obstacle, it’s not like a tunnel where you can send them, and then reposition yourself or prepare for the next command, or even a jump where you have a split second to think about what’s next. With a hoop any mistakes you have made as a handler are highlighted, if you’re late with a command you don’t have that time in the air for your dog to hear it, land and then correct. With a hoop if you’re late they are still running full speed in the wrong direction! Highlighting the handling problem of not signaling your turn early enough. This is why hoops are included on NADAC courses and will continue to be used. They are a great highlight of late or bad handling, which we feel is a great test, and a great addition to most courses.